To overlook this attraction in planning our US Tour would’ve been a big mistake and an easy one to make. I’m so glad we didn’t make that mistake. I hope you’ll read through this post and maybe visit this site one day yourself. 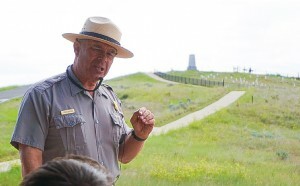 The Little Bighorn Battlefield and it’s memorial aren’t pretty I’ll be honest. After seeing the beauty of places like Yellowstone, Bryce, Zion, Slot Canyon and the Grand Canyon it’d be easy to pass on this stop. Visually it’s dull. But this place isn’t so much about the visual as it is the experience and that is compelling in ways you likely wouldn’t anticipate. They do a fabulous job of guiding you through the Battle of Little Bighorn from start to its famous finish with “Custer’s Last Stand”. If you take the time to follow the self guided tour you can see the whole conflict unfold before your eyes. It’s inspiring to stand on the ground where this history played out and experience the story. An emotional and educational experience I didn’t anticipate. Throughout the battlefield there are markers in place. 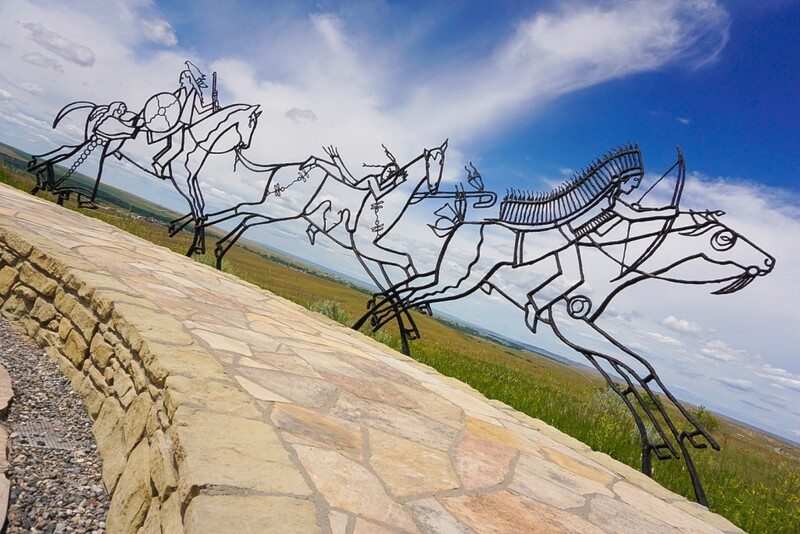 Each represents a man, either cavalry or Native American (Lakota and Cheyenne), and marks where they fell. Again moving, to realize these are spots where lives were lost. Many of the markers identified names of those you were reading about. Specific individuals who made their own mark on history in this noted battle. Prior to following the self guided tour we had also listened to a Ranger presentation about the battle. This was time very well spent as this Ranger was very knowledgeable and very passionate on the subject. He really brought the story to life. It bordered on theatrical, in a good way. This guy reminded me of the famous actor Tommy Lee Jones. Just imagine Tommy Lee Jones giving an impassioned monologue of the thrilling battle story. It was quite good and drew you in. 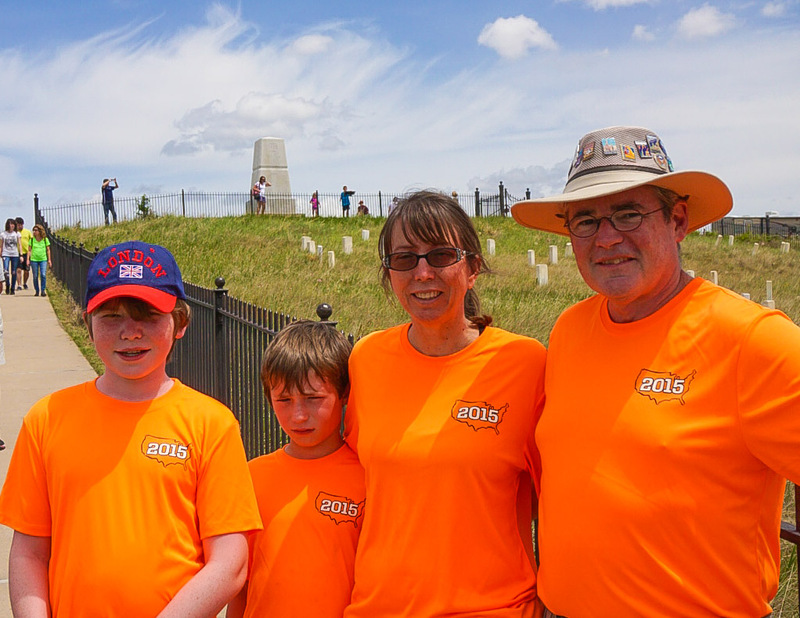 If you’ve read this far I want to share with you a couple of things I took away from our visit to the Little Bighorn Battlefield. Maybe I needed to brush up on my history better because some of these things surprised me. Dawnie noticed and I found it interesting to note, none of the American battalions actually ever reached the Native American encampments. And of the few cavalry which got the closest, none were in any of Custer’s companies. All five companies of the 7th Cavalry under Custer’s command that day lost their lives but there were many men under other commands who did survive. Also interesting was that the Native Americans didn’t ever attack but rather they only defended their position. Valiantly, viciously and to great success. We also noted that many points in history since, there are examples of the Native American leaders extending their hands to move forward. Not forgetting the history but showing readiness to put it behind them. Often and with sad consistency these gestures were rebuffed. It was nice to see that there is now a memorial in place at Little Bighorn Battlefield for the Native American tribes which were part of this historical battle. This only came after those tribes requested the recognition but it’s progress just the same. I have to say I came away from visiting this site with a deeper level of respect and understanding of these Native American tribes. I see why their personal pride and tribal culture runs so deep. I’m sure I still don’t fully understand it but it’s impressive and impactful without question. It’s obvious that Custer and his men faced odds they didn’t anticipate and their total defeat could be attributed to sheer numbers alone. It’s hard to imagine any battle strategy changing that outcome. It’s also interesting to note though that in spite of those overwhelming numbers hundreds of U.S. Army soldiers in that battle (in companies other than Custer’s) did survive. Again, in the view of this admittedly novice observer, it’d look as if the Native American warriors were really defending as opposed to attacking. If they’d chosen to attack they could have easily wiped out every last soldier. 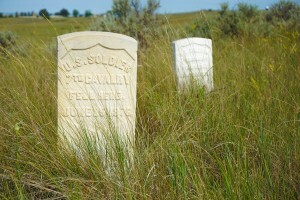 The Little Bighorn Battlefield, not a spectacular sight but a truly moving experience. 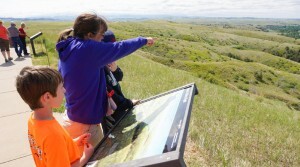 This entry was posted in Destinations, Little Big Horn, Montana, Northwest and tagged Battle of Little Bighorn, Custer's Last Stand, Little Bighorn Battlefield, Montana, MT. Bookmark the permalink. Custer had it coming. Because of arrogance of our forefathers, it is truly amazing for that hand you describe, outstretched by Native American leaders. No death from either combatant is noble enough to justify what happened there. If the history of Little Big Horn makes you think, look into the history of the Black Hills and Mount Rushmore. 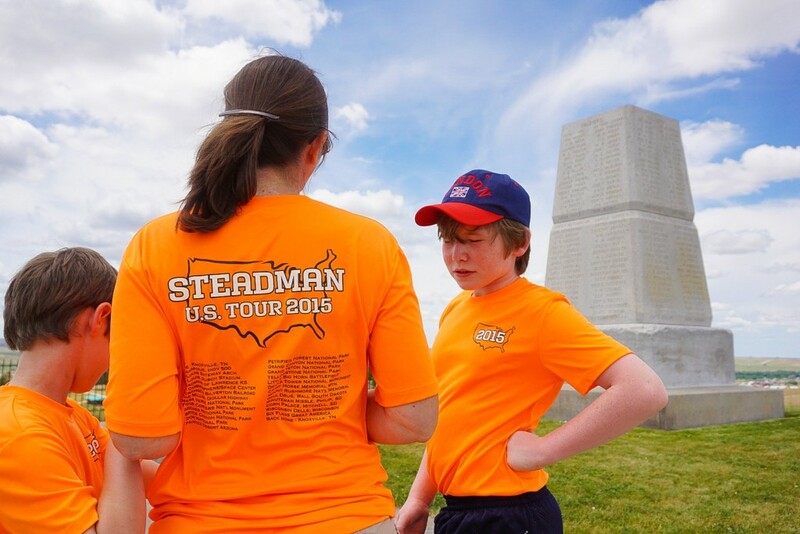 It is a wonderful thing you and Dawnie are doing with your boys, rock on Steadmans! deer decor on Gators love people, they taste like chicken! Authentic 2017 Scarpe,2017 Uomo Scarpe,2017 Donna Scarpe on Badlands, really! Plus a missile, drug store and a palace!